One of my chilhood biggest lessons was this. One of my Mother's strongest advice since I can remember is Be Yourself. Identify is one of the world's biggest tabus and misconceptions... it's also one of the strongest empowerment tools there is. Some People feel unconfortable with authenticity, they're so blinded with what the world draws in front of them, they do not know how to deal with difference. I feel that around me a lot of times, with a lot of people. Yesterday a man Laughed at me of wearing a head piece. 1st I was angry for a second, than I was sad for him, and how he would be wearing that grey suit all his life without even knowing who he really was, but than I realized thai I was being just like him, judging him without even knowing him, so I smiled at him and touched his arm and said thank you. He stoped laughing, the elevator door closed and did not see him again. I'm Cathlolic but carry with me everyday a lesson I've learned 20 years ago with a Buddhist priest: I talk about it all the time to my kids. we all have a mountain inside our chest - it's tall, it's beautiful, it' unbeatable, cannot be destroyed, cannot be torned down. We stand strong, no wind, no words, no acts can take us down. We stand strong, we accept life, we adapt, we let the worls around us be. We Are. We ARE. Year by year this lesson makes more sense to me. 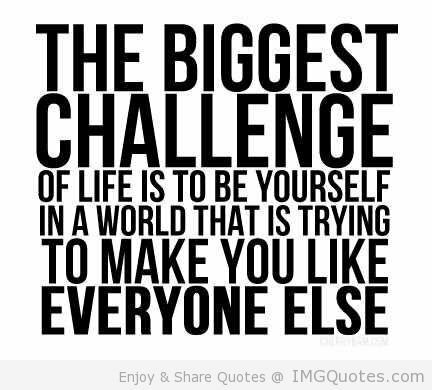 Because I do not want to be like everyone else, I don't force that, I just give in more and more to who I really am. "Only dead fish swim with the stream". Life is in us, not in how others tells us who to be. Who are you? 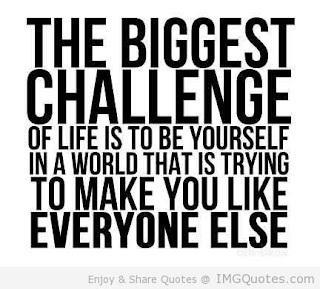 Be yourself always."